Whilst few of us are fortunate enough to have flawless skin, most are still looking for that miracle product, which will help clear it. With so many various brands promising us the desired results, it may be difficult to find one that stands out. 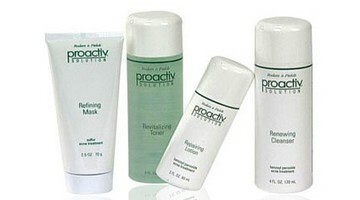 Proactiv are offering a range of products, which help clear skin, leave your skin feeling smooth and unclog pores. This review will look at how they work and whether they are effective in achieving flawless skin. · Proactive products are simple to use. If they are applied once a day, there will be noticeable changes after only 3-4 weeks. · You skin may develop dryness or redness if you are sensitive to Salicylic Acid. · It does not cure acne. Breakouts cannot be cured by any available product. Proactiv mainly controls it for as long as you use it. Proactiv works as a blend system by combining various ingredients in a way that helps manage breakouts. Unlike other products, it does not manage existing breakouts, but deals with them before they appear. The acne treatment comprises of three elements, namely cleanser, toner and lotion. The cleanser exfoliates your skin using scrub particles, unclogs the pores and kills bacteria, allowing the Salicylic Acid to penetrate. The second step is the revitalising toner with its main ingredient being glycolic acid. It exfoliates the skin and removes dead skin cells. It reduces oils but also prevents any dryness, which may be caused by the benzoyl peroxide contained in the cleanser. As it contains no alcohol, it does not cause dryness or irritation. The third step is the repairing lotion. The benzoyl peroxide in the lotion exfoliates the skin, kills the bacteria and penetrates deep into your skin treating the problem. Will Proactiv work for you? Proactiv is effective for many people who have acne. The benzoyl peroxide contained in Proactiv products is one of the most efficient ways to treat breakouts. Proactiv Solution is likely to help you with acne, but only if used consistently and as a 3-way system. The important thing to note is that Proactiv will not cure your acne. No product is capable of curing it and it can only be controlled. Therefore, if you are consistent with the Proactiv Solution and use it at least for as long as you see positive results, you should not be disappointed. However, every skin type responds differently to various products and whilst this product has been very successful for a lot of people battling acne and has received very positive reviews from both doctors and its users, it may not necessarily work for you. As the concentration of benzoyl peroxide in Proactiv products is low, it is not strong enough to cause irritation. However, those who are sensitive to the Salicylic Acid may experience mild redness or irritation. There are no other known side effects to Proactiv. Unfortunately, there is no miracle cure for acne and every product works differently for everyone. However, bearing in mind the popularity of Proactiv, the unlikely side effects and the positive reviews, it is a product worth trying by anyone experiencing problems with their skin. If you have any questions or concerns, please refer to the official Proactiv website, or contact the merchant directly. Only comment below if you have used Proactiv before and you would like to share your experience. Don't forget to use the star rating system.